Last time I painted the long, rock solid history of Walmart in graphs and promised to talk about valuation in a following post. I doubt I can add anything of value for a company covered by over 30 sell-side analysts, who have sliced and diced it every way possible. That’s why I chose to have fun with it and do a prefect foresight discounted cash flow valuation. As you might have imagined, in a perfect foresight DCF valuation, we don’t have to forecast growth rates. They are a given, thus, taking a lot of the guesswork out of the equation. So, having put together the financial data for the past 45 years, I decided to value Walmart retroactively. Basically, I asked, “How would I have valued Walmart each year since 1968, if I knew the cash flows that I was going to get out of it in the coming 44 years?” I am not big on DCF valuations and complex Excel models, but I imagine, with this perfect information, DCF ought to give me a pretty accurate estimate of intrinsic value. After all, what is a business worth if not the discounted value of its future cash flows? For the purpose of this exercise, I relied on a modified version of Professor Damodaran’s (who is an authority on valuation and a wonderful person) free cash flow to the firm (FCFF) valuation spreadsheet. FCFF is defined as after-tax EBIT (adjusted for operating leases) less cash spent for capital expenditures (adding back depreciation and subtracting capex), less investments in working capital. It is the cash left for the owners of capital to take out of the business, if they so please. Normally, in arriving at a cost of capital to discount these cash flows, assumptions about risk-free rates, reinvestment rates, tax rates, equity risk premiums, and the capital structure have to be made. But not in this perfect foresight DCF valuation. I have relied on historical data. Except for terminal value, where I had to assume a stable growth rate of 3%, reinvestment rate of 20% (the industry average for retail/wholesale stores), tax rate of 38%, and a 7% cost of capital (3% risk-free + 4% to approximate the market average for safe companies). My major issue with DCF valuation is the false sense of precision it gives. False, because people are terrible at making predictions (especially about the future). Instead of precise 10-year growth forecasts, a good understanding of whether the company would still be there, doing similar things in 10 years is the most we can reasonably expect, and not always. Then, there is terminal value. It is often a large component of company value and it is super sensitive to minor changes in assumptions. For my Walmart perfect foresight DCF valuation, terminal value accounted for around 80% of enterprise value. So, despite using historical data for most inputs, the assumptions for the terminal phase will weigh heavily on the valuation. Then, why not use a range of multiple valuations instead of a superbly tuned model that provides just as vague a range of intrinsic value? After all, we are trying to be approximately right rather than precisely wrong, right? But, without any further ado, here is the graph of the day. Ignore the blue and red lines for now. Book, market, and intrinsic value are graphed on the left axis in millions of dollars. According to my valuation, over its public history, Walmart has been overvalued only in the 4 years between 1999-2002. The rest of the time Mr Market has been generous. I get a value of $78 at the start of 2012 against a market price of $59. This seems about right to me. Last August around this time, I was looking at Walmart, which, at the time, resembled a supertanker in high seas. Without the help of a fancy model, I came up with an intrinsic value range of approximately $65-85. Yet, I was too cheap and wanted to buy it at or below $50, implying around 9% earnings yield. I couldn’t. Fast forward to today, and I have missed on a 40% gain in one of the safest companies out there. Back in December 1987, when Buffett was looking at Walmart and trying to get it at $23, the spreadsheet tells me intrinsic value was in the vicinity of $100-120. This seems excessive for a company that was going to earn $1.11 per share for the year ended January 31, 1988. Buffett’s target price implies an earnings multiple of 21. This could be why he was unwilling to bid higher. Buffett has been quoted saying it cost him $10 billion. By my estimate, failing to buy 100 million shares at an adjusted cost of ~$2 and a current price of ~$72, equates to a $7 billion foregone profit. But that’s an exaggeration, because he started accumulating shares around 1990 and thus, captured some of the upside. In fact, he was there for the big spike in market capitalization in the late 90s that is so obvious graph. This brings me to the fluctuation in share price and book value over time – the blue and the red line, respectively. This part of the graph is a good illustration of the vicissitudes of the market. 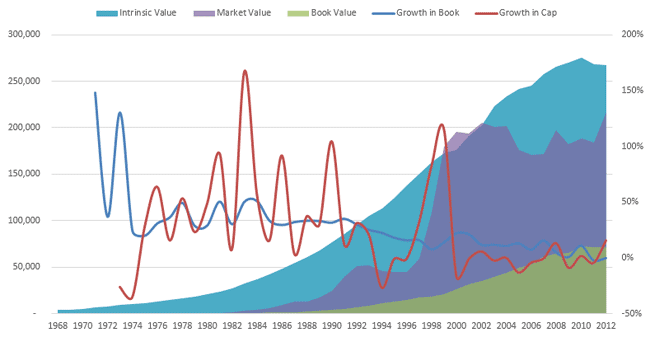 Changes in share prices are all over the place (except for the past 10 year, when it has gone nowhere) while book value growth moves steadily to a gradual halt. In conclusion, Walmart has been a great business and a great investment. Since going public in 1970, it’s stock price has compounded at close to 20% annually. At this rate, $1,000 invested back then would be around $2 million today. Walmart is the largest private employer in the world with some 2.2 million employees. It is among the top 3 biggest companies by revenue. Sam Walton was the richest man in the US between 1982-1988. Today, the Walton family fortune is estimated at $102.7 billion, according to Forbes. The Walton’s control 48% of Walmart. What made Walmart such a huge success? Sam Walton was no genius. He didn’t invent anything. For the most part, he copied ideas from other retailers like Sears and Kmart. From the start at his Ben Franklin franchise, he was constantly at his competitor’s store across the street, checking how they were doing things. Sam lifted the self-service idea, the iron fixtures idea (instead of expensive wood), the hypermarket idea (from Carrefour), and so on. He drove a hard bargain with suppliers and flew (on an Air Coupe he bought for $1,850) around to pick the best locations for his stores. Sam Walton had a passion for retail from very early on. He loved all aspects of the business, especially, merchandising. I believe that, as all great things, Walmart’s success was due to some combination of effort, focus, ability, and opportunity. Basically, Sam was the right person at the right place and time.